Often conducting first- line assessments for patients, Diagnostic Radiographers do more than simply take black and white scans. D iagnostic Radiographers are maestros in handling sophisticated medical imaging equipment such as X-ray, Computed Tomography (CT), Magnetic Resonance Imaging (MRI), and Ultrasound among others. With the Diagnostic Radiographer’s skilful technique, images and scans are produced to aid in a doctor’s clinical diagnosis, making the role of Diagnostic Radiographers essential in the medical team. Hwa Chong Junior College alumnus Mignon Sim Ru and Pioneer Junior College alumnus G Kasthuri are on their way to becoming Diagnostic Radiographers. They are currently 2nd year and 3rd year students at the Parkway College of Nursing and Allied Health, and are also holders of an Educational Sponsorship Award from ParkwayHealth Radiology. They talk to us about their interesting educational journey thus far, and how the rigorous course structure at Parkway College is priming them for the profession. HOW DID YOU LEARN ABOUT AND COME TO CHOOSE PARKWAY COLLEGE? 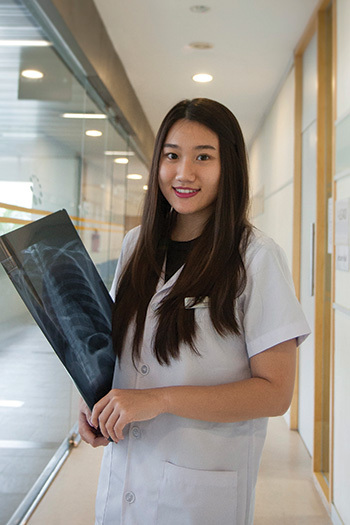 Mignon Sim Ru: I learnt about Parkway College when I was browsing through the Internet in search of a local healthcare institution after my ‘A’ Levels. I realised that Parkway College stood out from the other local universities, as it is the only institution offering an accelerated programme for my course. The closest course offered by a local university was Life Sciences, but it focuses on bacteria and plants instead of the human anatomy. Apart from that, knowing that I was able to complete my Honours degree in just three years, instead of the usual four years cemented my decision to pursue my education here. G Kasthuri: I first heard about Parkway College from my father. He chanced upon the institution’s advertisement on the Diagnostic Radiography and Imaging course, and brought it to my attention knowing that I was looking for a degree in healthcare. Upon further research, I felt that Parkway College was a great fit for me because of the rigorous course structure offered in collaboration with the University of Hertfordshire. I decided to pursue my education here because students like myself are able to obtain an internationally recognised degree without having to spend an exorbitant amount of money studying overseas. WHAT SPARKED YOUR INTEREST IN THE FIELD OF RADIOGRAPHY? Mignon: Apart from my interest in the human anatomy, I was inspired to pursue radiography from my many hospital visits due to sports related injuries when I was younger. During these visits, I would see these people in lab coats patiently take my X-ray, Ultrasound and MRI scans. I did not know who they were then, but the care and concern they showed left an indelible mark on me. When I found out they were radiographers and began to understand the roles they play in a clinical diagnosis, it spurred me on to make this my career choice. Kasthuri: My favourite lesson is school has always been science, and in particular laboratory sessions. I find the process of analysing and studying results gathered from experiments very interesting. This process is similar to radiography. Radiography requires images obtained from specialised equipment to be studied before a diagnosis can be made. The aspect of being able to learn about these black and white images and eventually comprehend them may seem boring to some, but it gives me a great sense of achievement and pride. SHARE WITH US THE EXPERIENCE YOU HAVE HAD DURING YOUR CLINICAL ATTACHMENTS. Mignon: I have been attached to numerous private and public local hospitals for my clinical attachments. I enjoy my attachments as they have been very interactive and informative. I had opportunities to interact with real patients, perform x-rays for them and assist radiographers whenever possible. Practical assessments were also conducted during my attachments, where we were assessed on how well we could handle a case from the time a patient enters the room to when they leave. These attachments have really given me a better insight into my future career and allowed me to learn beyond a classroom setting. Kasthuri: My clinical attachment has been useful to me because I was able to put the theory learnt in school to use. Besides machine handling practice, I have picked up many invaluable lessons about radiography from working alongside experienced radiographers. Most importantly, interactions with patients on- the-job have allowed me to build my professional confidence and experience first-hand what being a radiographer is all about. WHAT ADVICE WOULD YOU HAVE FOR THOSE CONTEMPLATING THIS COURSE OF STUDY? Mignon: You must have a heart to serve and want to treat every patient with care and concern. My advice is that if you are looking for a 9-5 desk job, a career in healthcare may not be for you. However, if you are adventurous and want to make a difference in the healthcare sector, being a radiographer can be very rewarding. Seeing how my role helps doctors make holistic diagnosis and patients receive proper medical care is, to me, the most rewarding aspect of being a Diagnostic Radiographer. 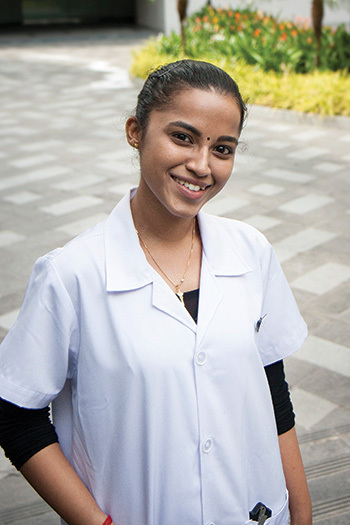 Kasthuri: Adding on to what Mignon has shared, my advice would be to choose a course which you are really interested in, stay goal- focused and put in hard work. 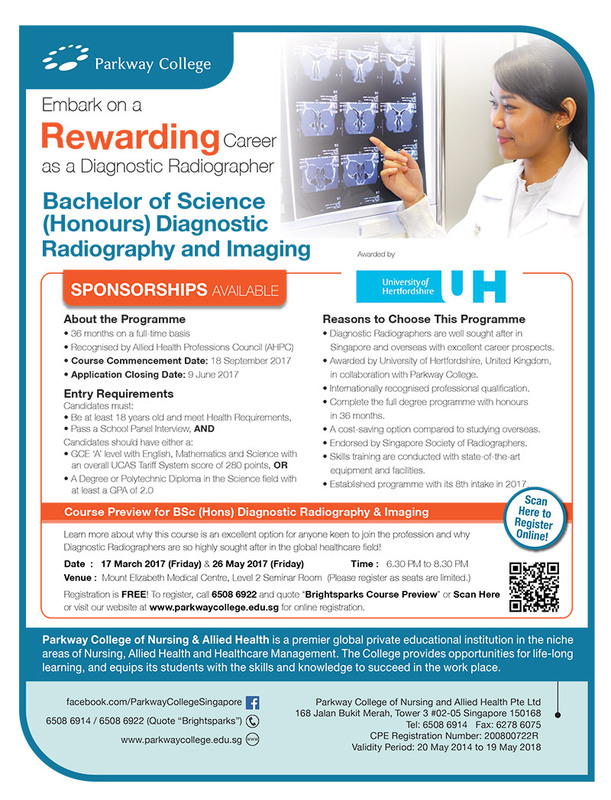 If your interest happens to lie in the healthcare industry and you love challenges, studying to be a Diagnostic Radiographer might be for you. Although a relatively niche occupation, it offers many career advancement opportunities and pathways to grow and learn as your career progresses. All Rights Reserved. Copyright © 2019 CareerBuilder (Singapore) Pte Ltd.